Two of Whitby Town’s key players could be set for a dramatic rise to prominence after being handed places at Jamie Vardy’s V9 Academy. Vardy’s well-documented rise up the non-league ranks through to winning the Premier League with Leicester City last season, has led to the England striker setting up a new academy to unearth new talent in the lower leagues. Midfielder David Carson and defender Andrew May will head to Manchester City’s Etihad Training Campus between June 5-9. Blues boss Chris Hardy is delighted with the news. 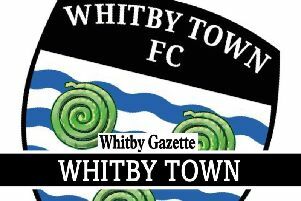 He told The Whitby Gazette: “It’s great for David and Andrew and also for the club too. “David’s agent sorted this for him and Andrew was watched by scouts and invited along to the Academy. “It’s great that the club are getting plaudits like this, on and off the field.